On a clear morning in July 1804, Alexander Hamilton stepped onto a boat at the edge of the Hudson River. He was bound for a New Jersey dueling ground to settle his bitter dispute with Aaron Burr. Hamilton took just two men with him: his "second" for the duel, and Dr. David Hosack. As historian Victoria Johnson reveals in her groundbreaking biography, Hosack was one of the few points the duelists did agree on. Summoned that morning because of his role as the beloved Hamilton family doctor, he was also a close friend of Burr. 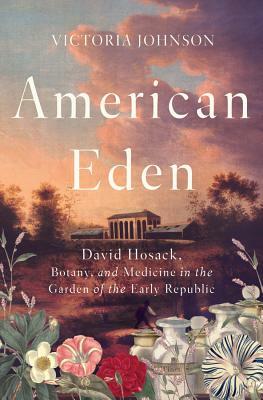 A brilliant surgeon and a world-class botanist, Hosack--who until now has been lost in the fog of history--was a pioneering thinker who shaped a young nation. One goal drove Hosack above all others: to build the Republic's first botanical garden. Despite innumerable obstacles and near-constant resistance, Hosack triumphed when, by 1810, his Elgin Botanic Garden at last crowned twenty acres of Manhattan farmland. "Where others saw real estate and power, Hosack saw the landscape as a pharmacopoeia able to bring medicine into the modern age" (Eric W. Sanderson, author of Mannahatta). Today what remains of America's first botanical garden lies in the heart of midtown, buried beneath Rockefeller Center.